Is that the famous Hollywood sign? Once more from the top: Cliff Bleszinksi's doing something, doo-dah, doo-dah, no we don't know what it is, oh, doo-dah-day. The last time we saw anything from this project it featured a mysterious man with a gun. Now we get to see a mysterious city - possibly Los Angeles, as seen from Mount Lee - being treated like the Biblical cesspit it ... I mean, being struck by lightning. What this has to do with anything, God, and presumably Bleszinski, only knows. 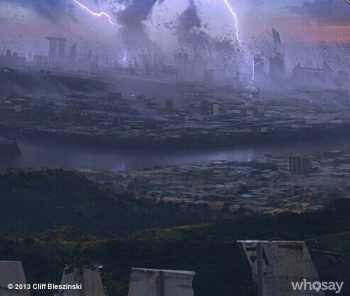 It's still just "another cropped picture from something I'm working on," according to Bleszinski. The "much needed break" Bleszinski said he needed, after he left Epic, is over. Whether or not these images have anything to do with the game studio he said he was thinking of opening is an open question. He still hasn't committed to anything yet, whether as an independent or as someone's employee. Ubisoft was supposed to be interested, but that was back in November 2012, and it's been more than half a year since then. If anything was to come of that dinner date, you'd think it would have happened by now. So, place your bets. Is this Los Angeles, or Glasgow? Are those lightning strikes, or savage corgis on the rampage? Will this be a game, a documentary, a pigeon breeding app, or something else?